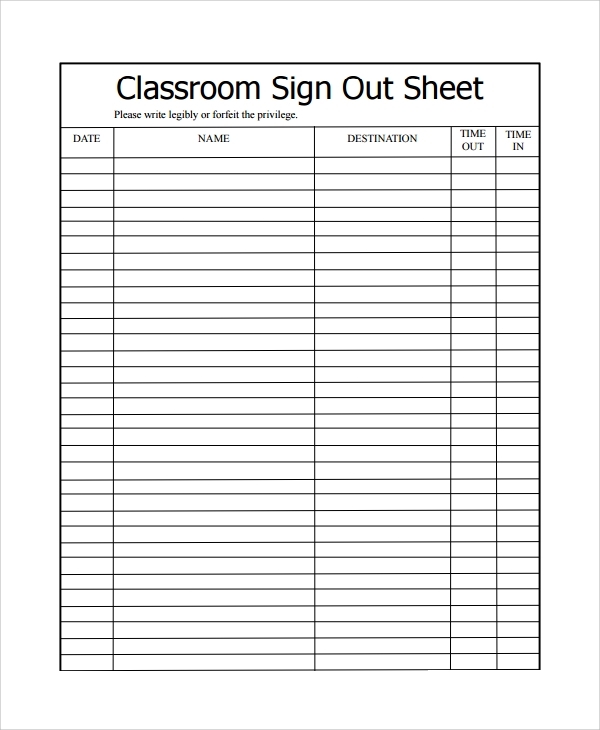 A classroom sign out sheet is a beautiful concept, made to organize timings, dates, and usage of materials in a classroom. There are many students in a school, college, university or other educational or skill development institute. Monitoring all of them by eyes is just not possible. The maintenance if master sheets of data is a must. These sheets help track the student timings, their daily schedule behavior, and the items they are borrowing from the institute and return of the same. 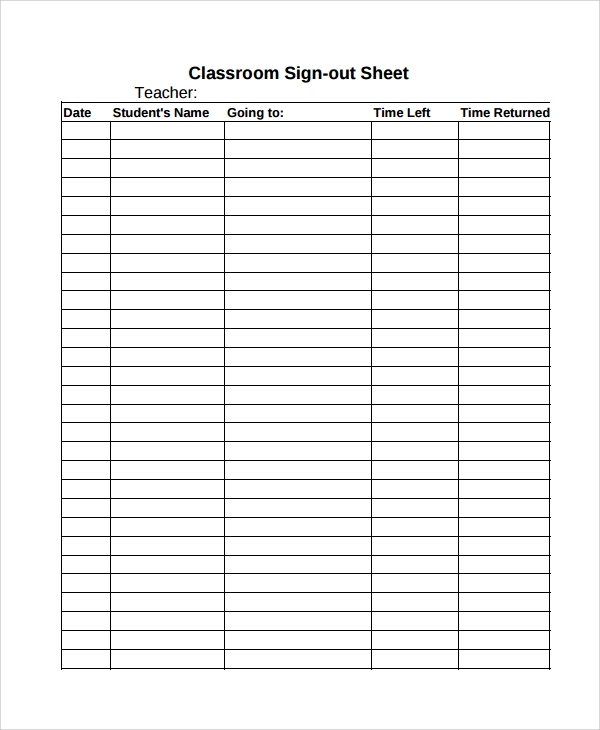 The classroom sign-out sheet which students should be made to use and sign tracks specifically these departments. You can also see Equipment Sign Out Sheets. When a student borrows a book from the library then the same has to be duly returned by a date. And the whole taking and returning date should be recorded in the institution’s library records so that no confusions arise later about the book or resource. This format or template bears the necessary fields for a library sheet. The sign out sheet is a nice concept where the student’s destination is also recorded so that an exact calculation of the timing can be done. The time of in and out, the destination, the date, and the student name are the fields generally in such templates which make it easy to track the student’s timings every day. 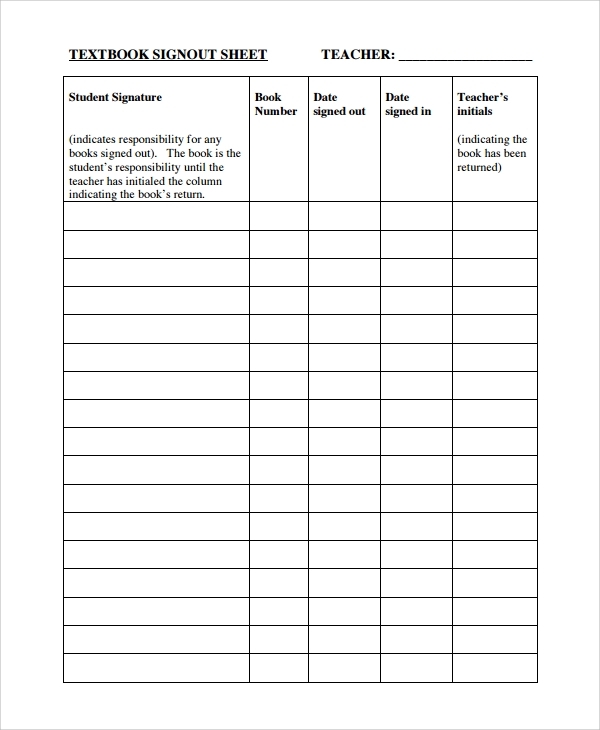 The sign out sheet for the classroom material is a concept to keep a track of the items which the students are borrowing from the institution. Pens, books, maps, markers, sheets whatever the students are taking should be returned back. To keep a track, so that no item is lost, the sheet helps immensely. The template gives a ready format for this sheet. 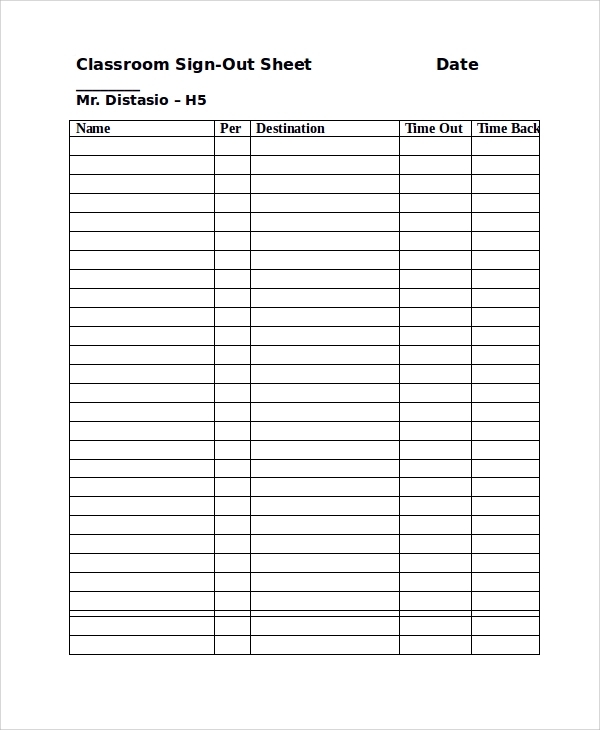 Why You Need the Classroom Sign Out Sheet Template? The templates are extremely useful in making things organized in a school or college or other educational or skill development institution. 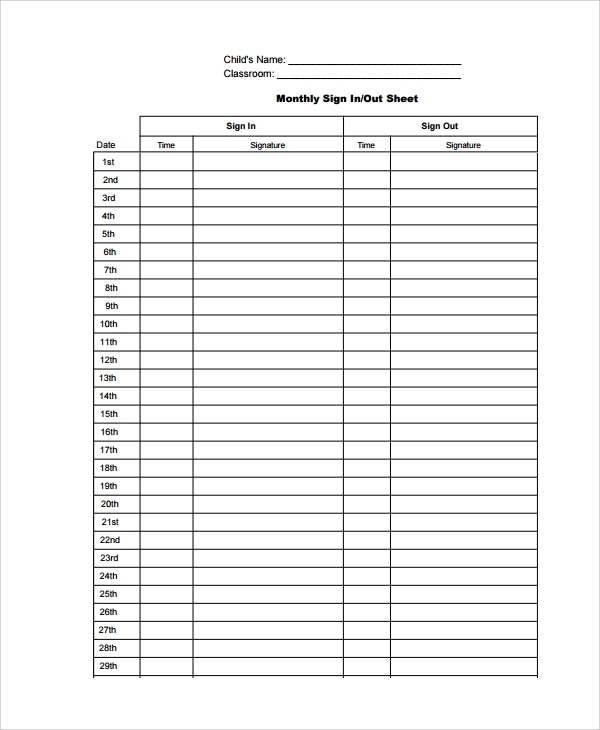 If you are not sure how to start making or designing a proper sheet to track the students’ timing, resources used, etc, then you must refer to these templates to understand the pattern. In fact, you may download the templates straightaway and take prints. This makes it easy for you to manage timing, discipline, and resources within the institution. 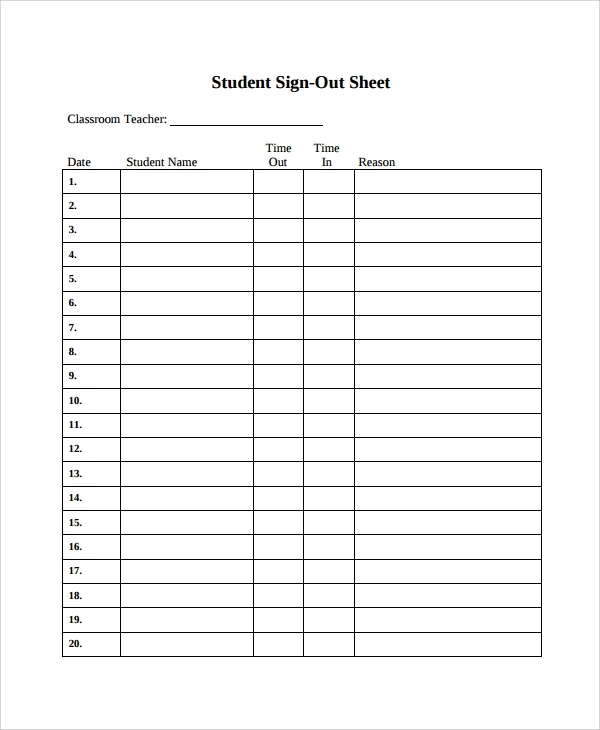 You can also see School Sign Out Sheets. Templates are to make things easy for you in this fast lifestyle. If you spend a whole day using a scale and a pencil to make a register for the students’ library behavior then you would be wasting time actually. There are a lot of other works to be done, and moreover, you should take the opportunity of the availability of templates in bypassing the job of manual work. This makes it look much standard and organized when you are using a nice formatted template for keeping track of student sign out records. How to Use the Sheets? 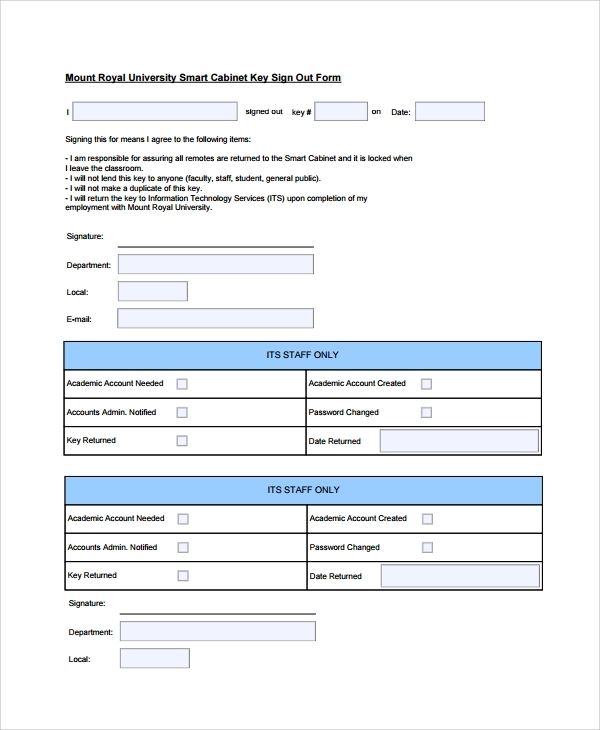 The student sign out sheet templates is available in multiple formats for various uses. Some are for the library only, while some are for the computer practical room. Some are for the resources they are lending, and some are for the tracking of class timings or hostel timings. That means you get a separate style and format of sheets online for every specific use. This makes it even easier for the institutions, as they can simply surf, find, choose and download one template they need, and start using the same digitally or after printing. You can customize the name and address of the institute on the template as needed. You can also see Training Sign In Sheets. 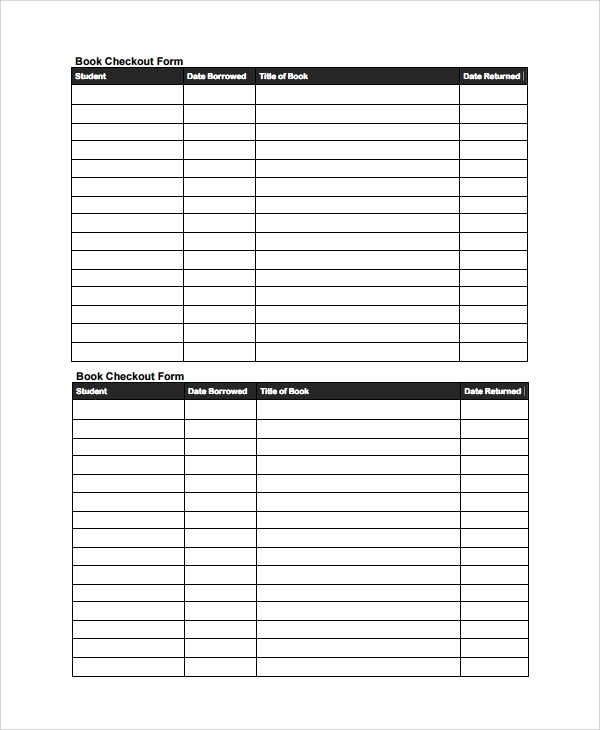 The student attendance sheet format is a nice way to tell and track the behavior of the students, their attendance, and participation etc. The templates help track these and make it easy and time-saving on the institutions to start the process. The availability of templates are varied, and hence you always have more choices than you feel are there. What Is the Importance of Petition?